Banastre Tarleton was the son of merchant John Tarleton, a Lord Mayor of Liverpool in 1762, known as the "Great T." Since the seventeenth century, the Tarletons made a fortune in the shipping trade, including the slave trade. John Tarleton had a large house on Water Street which later became the King's Arms hotel. Banastre Tarleton, the second of John and Jane Tarleton's six children, entered University College, Oxford, on November 2, 1771, but he seemed more interested in gambling and the high life rather than studying. John Tarleton died in September 1773 and Banastre inherited £5,000 under his father's will. He was soon through this money and needed a new career. Luckily the American rebellion was developing and this offered Tarleton the chance to join the British Army and escape his debts. On April 20, 1775, his mother paid £800 for a cornetcy for Tarleton in the 1st Regiment of Dragoon Guards to begin his military career. The day prior, rebels had fired on British regulars in Lexington, Massachusetts, and in December 1775 Tarleton volunteered to go to America with Lord Cornwallis, who was leaving for America with five regiments of infantry. Tarleton's early career during the American War for Indepence is most memorable for his participation in the capture of American General Charles Lee at White's Tavern at Basking Ridge, New Jersey, on the morning of December 13, 1776 as part of a British patrol commanded by Lt. Colonel William Harcourt. In a letter to his mother following the episode, he sounds like the excited boy he was, as he extolls, "This is a most miraculous Event -- it appears like a dream." In January 1777, Tarleton was promoted to captain in Lt. Col. Harcourt's cavalry command. On January 8, 1778, he became captain of the 79th Foot, the 1st Company, Royal Liverpool Volunteers. On January 20, he was part of a force that nearly captured Captain Henry Lee, father of Confederate General Robert E. Lee, at the Spread Eagle Tavern near Valley Forge, Pennsylvania. During the winter of 1777-78, while Lt. Gen. Sir William Howe's army occupied Philadelphia, and Tarleton was able to engage in the same type of rich social life he had tasted back in England. He gambled, attended the theatre, caroused, and became friends with another controversial British officer, Major John André, later hung as a spy by the Americans. The social circle included Loyalist belles such as Peggy Shippen and Peggy Chew. Tarleton and André were part of the "court" of high-spirited, well-educated young officers who around Howe. Tarleton was a member of André's acting troupe, and also served as one of the "Knights of the Burning Mountain" in a jousting pageant. During the spring and summer of 1778, an effort was made by Lt. Gen. Sir William Clinton to form Loyalist volunteer companies. This lead to the organization of the "British Legion" under the initial command of Col. Lord William Cathcart with Tarleton as lieutenant colonel, at the tender age of twenty-three. Tarleton's biographer Robert Bass has noted that at this point Tarleton had only been in the army for two years, and he had no great wealth or royal patron to help him. He had risen to this rank on merit, give or take the fact that his family money had purchased his cornetcy. When Cathcart was given the rank of quartermaster, this left Ban in command of the Legion. The unit was a mix of cavalry and light infantry made up of American Loyalists from Pennsylvania and New York. These men, being all Americans in origin, were not entitled to the pay and retirement rights of British regulars. The force was uniformed in green, thus giving rise to the name "The Green Dragoons." This would set the stage for Tarleton's reputation to be made in the southern campaigns of the American Revolution beginning in 1780 which the British hoped would turn the war in their favor. Tarleton was selected to command the British cavalry under Lt. Gens. Sir Henry Clinton and Lord Charles Cornwallis in an expedition to subjugate the four southern colonies of Georgia, South Carolina, North Carolina and Virginia. Cornwallis, under a plan developed with Lords Amherst and Germaine, embarked on board a flotilla of 140 ships for the Southern Colonies. It proved to be a stormy passage, in which the ships were blown south toward Florida. The bad passage caused a number of the horses to be destroyed, their carcasses thrown overboard, because of serious injuries such as broken legs. At Savannah, Georgia, 1,400 infantry were put ashore as a diversionary force to draw the attention of American Southern Continental Commander Maj. General Benjamin Lincoln. At the same time, Tarleton's cavalry was put ashore to remount themselves. On the way north to South Carolina, Tarleton's cavalry skirmished with Lt. Col. William Washington and his Virginia cavalry. While serving as a screening force for infantry, Tarleton scattered rebel militia at Bee's Plantation on March 23. When Tarleton reached Charleston, General Clinton gave him the responsibility of cutting off supply lines to the city. On March 26, he again skirmished with Lt. Colonel Washington at North Carolina Rebel Governor John Rutledge's plantation where he had to withdraw. Tarleton typically moved his forces quickly, moving them at a relentless pace and using slashing, surprising attacks. The rapid movement of Tarleton's force enabled him to catch up with a Virginia unit under Col. Abraham Buford leading to what has become known as the Waxhaws massacre, May 29, 1780. This incident, accounts of which are confused and contradictory, cemented Tarleton's reputation amid Americans thereafter as a ruthless leader. It is not clear whether Buford was given the opportunity to surrender and refused it, or whether Buford had surrendered and Tarleton ordered his men to massacre the Americans. However, as pointed out by Holly Calmes, "Tarleton didn't commit any more atrocities than Patriots William Washington or William Campbell." As stated on one website, "Patriots claimed that because Lt. Colonel Tarleton did not want to be slowed down by prisoners, he ordered that everyone be killed. Tarleton himself claimed no responsibility and said that his men merely reacted out of anger when they thought he had been shot and killed after a flag of truce had been raised. A disputed account survived through a letter by Dr. Robert Brownfield." This letter of 1820 was, surprisingly, the first to actually claim there had been a massacre. Tarleton's reputation for ruthlessness was enhanced after the Battle of Camden, South Carolina, August 16, 1780, when Tarleton's Legion was sent to pursue and cut down fleeing rebel militia units. He pursued them for twenty miles before turning back to return to the field. In late September, Tarleton became ill with malaria and was bed-ridden for three weeks. Without his leadership, the Legion performed poorly. On his recovery in late 1780, he spent weeks in the swamps and backwoods of South Carolina trying to capture General Francis Marion, who gained the nickname the "swamp fox" because of his elusiveness. In early December, there was a change in the southern command of the rebel forces when Maj. Gen. Nathanael Greene replaced Maj. Gen. Horatio Gates. In late December, Greene divided his forces and sent Brig. Gen. Daniel Morgan across the Catawba River into South Carolina to harass British interests. On January 1, 1781, Cornwallis ordered Tarleton to pursue Morgan. This lead to the Battle of Cowpens, South Carolina, on January 17, 1781, which was Tarleton's most grievous defeat. Perhaps impetuously, Tarleton ordered the Legion to charge against the militia who formed the rebel's first battle line. The initial attack caused some British casualties and Tarleton ordered a bayonet charge by his infantry. The American militia under Brig. Gen. Andrew Pickens fired and withdrew behind a hill where Washington's cavalry were in hiding. Tarleton ordered his men forward against the Continental main line formed up on the hilltop and called in some of his reserves to help flank the Continentals. General Morgan then issued an order for the right side of the Continental line to bow back to prevent being flanked, but the order was misinterpreted and they began to fall back. Lt. Col. John Eager Howard rallied the Americans and they stood their ground, leading to the British retreat and withdrawal with the loss of 800 men. On March 15, 1781, at the Battle of Guilford Courthouse, North Carolina, Tarleton served as part of the advance guard and receive the wound that would cost him two fingers. He stayed in the saddle and led another attack later in the battle. In May, 1781, Cornwallis and Tarleton marched north to Virginia where Tarleton continued his raiding. In early June, Tarleton almost captured Governor Thomas Jefferson at Charlottesville. He routed the local militia guard, captured about half a dozen members of the Virginia legislature and destroyed munitions and supplies. Tarleton's last skirmish of the war took place near Gloucester Point, Virginia, on October 3, where French cavalry surprised and defeated his Legion. On October 19, following the Battle of Yorktown, General Cornwallis surrendered the British army to General Washington, ending the war. On January 18, 1782, the war hero rode into London -- one of the few British officers to gain laurels in the American conflict. On February 2, a family friend wrote: "The famous Tarleton looks as young as when you knew him at Norwich. He is much en vogue. He is invited, known or unknown, to all the assemblies, and wherever he stands, a circle is formed around him." He also had his portrait painted by a couple of famous artists. The stance that Tarleton takes in the famous Reynolds portrait appears to be to hide the two fingers he lost in battle. The portrait was premiered at the Royal Academy on April 29, along with another portrait of the young lieutenant colonel by Gainesborough. The latter portrait did not survive. Apparently it was never paid for, although his mother did pay for the Reynolds painting. He entered on a political career, running for the job of Member of Parliament for Liverpool. On the stump, Tarleton was not averse to displaying his injured hand. His demeanor contrasted with another Liverpool parliamentary candidate, Bamber Gascoigne, who, injured in the heel, was evidently facing away from the enemy rather than facing them, as contemporary jokesters and Tarleton partisans were quick to point out. According to Richard Brooke's Liverpool in the Last Quarter of the Eighteenth Century, Tarleton was a particular favorite of the fishwives and market women of Liverpool, who carried green boughs and shrubs and wore green ribbons in honor of his green uniform (Brooke, pp. 378-379). Tarleton boasted, "tho' I have lost two fingers, I can use my pen, and will draw my sword when I can do my country service, and when I appear next in the field, my utmost endeavours shall be not wanting to be more successful." (Gore's Liverpool Advertiser, February 21, 1782, quoted by Brooke, p. 377). Elected to Parliament, he served seven terms as MP for Liverpool, where he controversially defended the slave trade, not surprisingly since his father and his brother John were both engaged in the trade. In 1786, Tarleton was criticized in letters published in the London papers for his decisions in the Battle of Cowpens. Tarleton, in his book, History of the Campaigns of 1780 and 1780 in the Southern Provinces of North America, defended his actions. At the same time, Tarleton criticized his former commander, Cornwallis, which lead to a break between the two men. After a long affair with the poetess Mary Robinson, Tarleton married Susan Priscilla Bertie, on December 17, 1798 at Lord Gwydyr's home in Whitehall. A week earlier it had been announced on December 11 that Tarleton was to command His Majesty's forces in Portugal, and on December 12 he was presented to the King. This command in Portugal did not please Tarleton and he returned to England, later to criticize the Duke of Wellington in Parliament. He would never take another active military command. Tarleton died childless at his home in Leintwardine, Shropshire, on January 16, 1833. The "classic," if romanticized, study of Banastre Tarleton is The Green Dragoon by Robert Bass (1957, recently reissued in paperback by Sandlapper Publishing, 2003), but a more recent and worthwhile work is Brutal Virtue: The Myth and Reality of Banastre Tarleton by Anthony Scotti (Heritage Books, 2002). The best and most complete website on Banastre Tarleton is "Oatmeal for the Foxhounds: Banastre Tarleton and the British Legion" This site nicely covers the different controversies about Tarleton, his longtime romance with poetess Mary Robinson, and his political career. A Hollywood version of Tarleton appeared in the shape of "Colonel William Tavington" played by Liverpool-born actor Jason Isaacs, in the 2000 Mel Gibson film "The Patriot." Tarleton's name came up at the time of the recent proposal to rename Liverpool streets that had connections to slavery, there being a Tarleton Street and a Banastre Street (now gone) in Liverpool. He was also in the news because a descendent recently auctioned off some American militia flags captured by Tarleton through Sotheby's in New York. Last edited by ChrisGeorge; 11-18-2006 at 12:55 PM. Banastre Street has well gone now, swallowed up by the tunnel approaches. His family also gave the name to Redcross St, which is now no more than a small rump off the Strand by the QE11 law courts and was named after a red obeisk they built. In the film, as so often happens to the British in American productions, he was portrayed very innacurately leading to a demand from then mayor of Liverpool Edwin CLein for an apology due to "misrepresentation and vilification" of a Liverpudlian hero. Many thanks for those clarifications and additional information. Of course, a Hollywood production company is rarely going to apologize for its misrepresentations unless it is forced by a court to apologize or make reparations, and the license that comes with making "art" might help them get away with it. At least the Tarleton character was fictionalized in that they changed the name to Tavington -- and a Liverpool actor got to play the part. They didn't even get Tarleton's uniform right in that instead of the green uniform that Ban wore they put the actor in a scarlet uniform like any other British soldier, but with green facing. 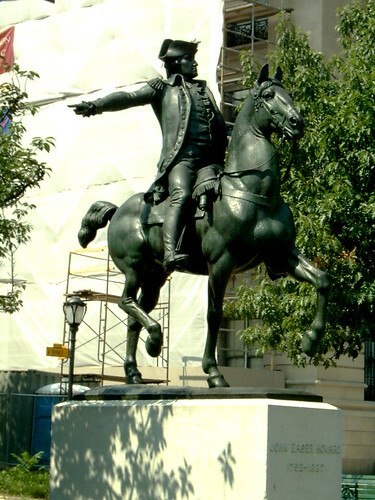 Incidentally, for people interested, there is a Banastre Tarleton discussion group on Yahoo. See also the Canadian Liverpool, Nova Scotia, site, Tarleton and the British Legion which gives links to all of the battles he was in. Brilliant I enjoyed reading that Chris. Thanks, Paul, glad it hit the spot for you. Although I have not seen the film, it appears that the new film "Amazing Grace" features a character based on Tarleton as an opponent of the movement to abolish slavery. As an MP, Tarleton did support slavery -- his family dealt in the slave trade and of course Liverpool commerce partly owed its wealth to the slave trade and trade in cotton, tobacco, and other commodities. It appears from the Internet Movie Database listing on the film that the character in the film though is "Lord Tarleton" so it can't be a wholly historical portrayal of the real Banastre Tarleton, who was in the House of Commons not the House of Lords. The following is from a Banastre Tarleton mailing list I am on (the URL for the list is above in a prior post of mine if anyone is interesting in joining). This is a moving and emotional movie about M.P. "William Wilberforce" and his jousts with M.P. "Tarleton" over the slave trade in England. I do not know how accurate the portrayal of "BAN" is in the movie and of course "BAN" is the heavy in the movie. This is the one movie so far this year that I think is a must see; especially for this group. It is accurate in that it uses the Tarleton name, M.P. representing Liverpool, and includes "BAN's" missing fingers in one scene. If there are any members who are more knowledgeable about "BAN" please comment about the movie's accuracy. Biographical films are generally tricky, since the on-screen personality rarely matches the real one; they’re even trickier when the subject is shrouded in misty time and debate. In some quarters, “Amazing Grace” will succeed better as a diversion than as a nuanced record of Wilberforce’s life. Historians have been divided on his legacy, with one d*amning him as “the mouthpiece of the party of order and of the business world.” A contemporary asked Wilberforce, after he introduced a law that set back the cause of trade unions, why he paid more attention to African slaves than to Britain’s working poor, whose interests he probably helped obstruct for years. Religious writers, not surprisingly, are more charitably disposed toward him. It’s equally unsurprising that the filmmakers don’t address these sharper criticisms. The film’s Wilberforce is a fanatic, a true believer, a crusader, a man of action and God, of stirring principle and tireless will. He’s at once pure and seductive, a dashing, romantic figure with a long black coat who talks to God while lying in his garden and keeps rabbits for pets. This matinee idol version might be wildly simplistic, even borderline caricature, but there is also something unfailingly attractive about a film character so wholly devoted to good. The screenplay doesn’t poke into the nature of that good — whether Wilberforce’s fight against slavery was truly selfless or flattered a sense of moral superiority — but it does make you think. It would be easier to dismiss “Amazing Grace” for its historical elisions if it weren’t also filled with so many great British actors larking about in knee breeches and powdered wigs; . . . The actor who plays Tarleton is mentioned in the review: Ciaran Hinds is mentioned although only his name and with the comment that Tarleton and a son of King George are "on hand for much of the parliamentary proceedings, delivering withering commentary and general amusement as two of Wilberforce’s most powerful foes." It appears from other sources, eg, the Internet Movie Database, that the character he plays is "Lord Tarleton" which is historically incorrect. Tarleton was in the House of Commons not in the House of Lords so that's a distortion right away. Of course all historical films are going to take liberties. "The Patriot" took major liberties with Tarleton. I would like to think that "Amazing Grace" is more truthful to the historical Banastre Tarleton but I wouldn't bank on it. From Wikipedia "Amazing Grace (2006 film)"
More on Banastre Tarleton from the Yahoo list. I saw this movie last night, and I agree it's one of the best I've ever seen. I do, however, question its accuracy. I confess I'm no expert, but I did notice a couple of things that were (I'm pretty sure) wrong. First of all, Ban would have been much younger, being only 26 when he went to war and the movie taking place about 15 years after. Second, the wrong fingers on Ban's hand were removed. I believe his index and middle fingers were the ones that he lost. And lastly, it was stated that he lost those fingers in Virginia. I'm 99.99% sure he lost them at Guilford Courthouse, which is in North Carolina. Haven't seen the movie yet, but it's my understanding that Ban lost the fingers in a relatively minor clash right before the incident at Guilford Courthouse. As far as WHICH fingers, that's up to debate. Some sources say "the first two fingers", which to us normally means the index and middle finger. A niece wrote that he was missing his thumb and forefinger. I read that he was eventually able to use that hand again in pretty much its full function. After learning more about the muscle structure in the human hand than I ever cared to learn, I came to the conclusion that it was the index and middle finger, because the loss of the thumb, especially with 18th century field surgery being what it was, would have rendered the hand almost entirely useless even in the best of situations. The muscles that anchor to the thumb are too dependent on it to be able to function without it. The best he could do in that situation would be to have a weak, three-fingered claw, certainly nothing he'd be capable of grasping a sabre hilt with, as he had reportedly retrained himself to do after training his left hand. The photograph shows the equestrian statue of Lt. Col. John Eager Howard, who in command of the Maryland Line, fought and helped to defeat the forces of Liverpool's Lt. Col. Banastre Tarleton at the Battle of Cowpens, South Carolina, 17 January 1781. The statue from 1904 is in Mount Vernon, Baltimore.